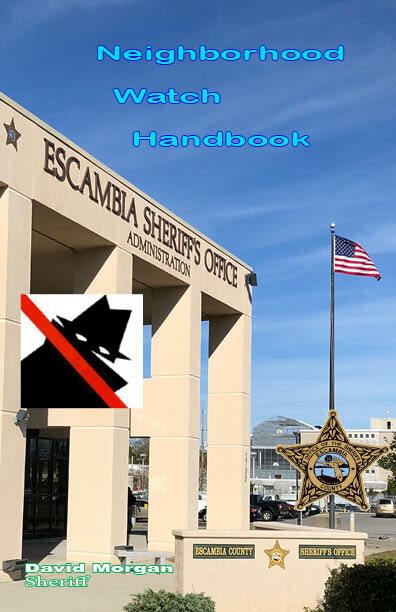 Call David Craig at the Escambia County Sheriff’s Office, Community Services Unit at (850) 436-9281 to schedule a time to set up the program and to provide necessary training. Locate a place and time for your first meeting and distribute flyers announcing the event to every household in the neighborhood – including people who may be creating problems. This will alert them that neighbors will be working with law enforcement to reduce crime in the neighborhood. ECSO will gladly provide you with the flyers. At the meeting, the ECSO representative will give you the basics, answer any questions and supply applications and other documents. Elect a President at that gathering to run subsequent meetings and act as the liaison between your members and the Escambia County Sheriff’s Office. Sheriff David Morgan is very pleased to offer a Neighborhood Watch Academy to interested Escambia County adult residents. These one evening seminars at our main administration building will be repeated throughout the year as dictated by the number of applications received. Then the Neighborhood Watch Academy is for you! Use our online quick sign-up form. The next available class is 5/21/2019. Please check with the individual neighborhood watch contact persons to confirm a specific meeting schedule. The information is updated regularly but is subject to changes without notice.